The brutal murder of 14 year-old Emmett Till in 1955 was both a singular atrocity and a bellwether for change. It didn’t spark the civil rights movement—countless other indignities not to mention the sweep of history did that. But it did presage sharply what that movement was up against: an entrenched evil, protected to the point of impunity, protected to the point of beating an innocent child to death and never answering for it. That’s American history, unsatisfying and unresolved as it is. It’s a fact of our history that two men were tried for Emmett Till’s murder and were acquitted of all charges by an all-white jury. It’s a fact that prior to that, but probably in anticipation of it, Emmett Till’s mother insisted on an open-casket service for her dead child. She asked the world to look at and remember a face that had been bludgeoned beyond recognition. We have to share in and of this history, all of us, because we all have an equal stake in learning from it. And we owe this much at least to Emmett Till, and so many others like him, because in taking their place in our history, in our narrative, they took the only measure of justice on offer. That meager return, writ depressingly more bold in light of present-day racial tensions, makes it arguable whether the best intentions of remembrance are worthless, are an insult, even. I hope that’s not true but it’s a discussion worth having. A perhaps unexpected reaction to this, and to Open Casket in particular, is the petition now being circulated online, calling for the Whitney to remove Open Casket from display, and destroy it. The reason? Artist Dana Schutz is white. So far the museum hasn’t responded or acquiesced, and Schutz has promised that the painting has never been sold and never will be sold. Her critics say that she lacks standing to interpret artistically any aspect of the African-American experience. It’s an accusation of cultural appropriation, where the cultural element in question was a watershed atrocity. So if this is a discussion worth having, and I think it is, the first hurdle in having it lies in the demand for censorship, in artistic erasure, that’s already on the table. The second is that definition of standing, which, ironically, manifests as racial exclusion. I have to reject that, on the grounds already mentioned: this is our history. Our story. 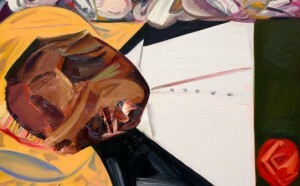 Dana Schutz and myself and a third of a billion other living Americans have not just the right but the obligation to remember what was done to Emmett Till, and to take from that whatever illumination is possible to better ourselves and to connect with each other. In more hopeful times we thought the days of atrocity were behind us, that there would be no more Emmett Tills. 2017 finds us more somber, more jaded. We see more clearly now the tenacity of hate. And we understand much better that our racial wounds have hardly begun to heal. So what’s left to us, but dialogue? To build and share a better world, we first must learn to communicate with each other, without barriers. We must come to the table as equals. That means we all have standing, we all own our past. We all own what comes next. This entry was posted in New Post and tagged Art, culture, Dana Schutz, Emmett Till, What is art?, Whitney Museum. Bookmark the permalink.